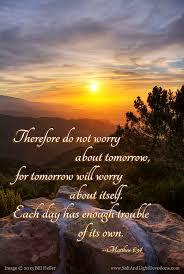 Scripture: Matthew 6:  Therefore do not worry about tomorrow, for tomorrow will worry about itself. Each day has enough trouble of its own. Observation: I spend so much time worrying about what might happen, I don’t enjoy the present. Today was Easter service at the beach. I was running around worrying and complaining about things I almost missed the full moon glistening on the ocean, the people surrounding me and most important why I was there. I’m writing this worrying about next week. Application: Trust in the Lord with all my heat, I need to make plans and preparations, but the rest is up to God. If I walk in His ways He will guide me through each day. Worrying takes me away from living the life that honors God. Prayer: Dear Lord you are my Rock, my salvation and my friend. 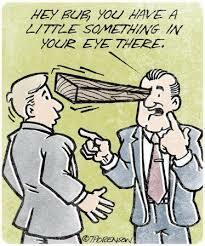 Take my eyes off my worries and place them on You.